UPDATE: added a third and fourth reference. Fourth: Food Navigator article that includes the standard response and additional follow up questions. If the edible insects market is heating up, and big name retailers from Publix to Sprouts are now stocking cricket bars, snacks and protein powders, why is Whole Foods – which has reportedly temporarily dropped all bug-based products – apparently cooling down? Third: A power point from by the director of the National Institute of Food and Agriculture (NIFA) Dr. Sonny Ramaswamy. The first is courtesy of Andrew Brentano of Tiny Farms. Tiny Farms has an excellent forum, Open Bug Farm, that covers a wide range is topics on edible insects. I attempted to secure my own copy by messaging the FDA’s Food and Cosmetic Information Center (FCIC). The first response did not have much content so I sent a follow up note. 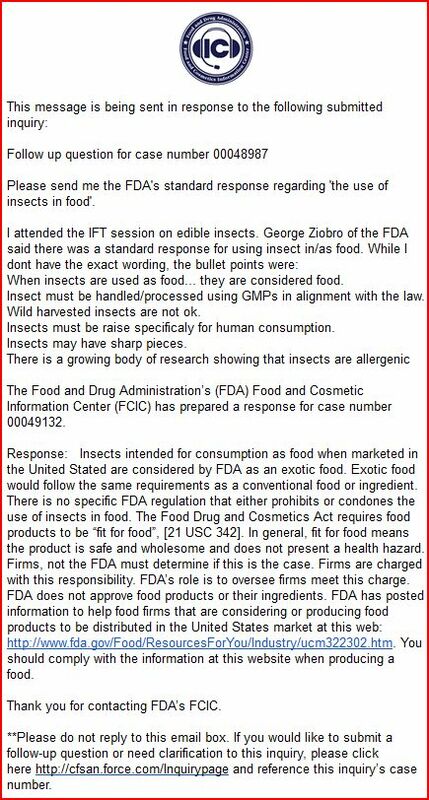 My interest in getting a copy came from the IFT (2015) panel discussion on edible insects. 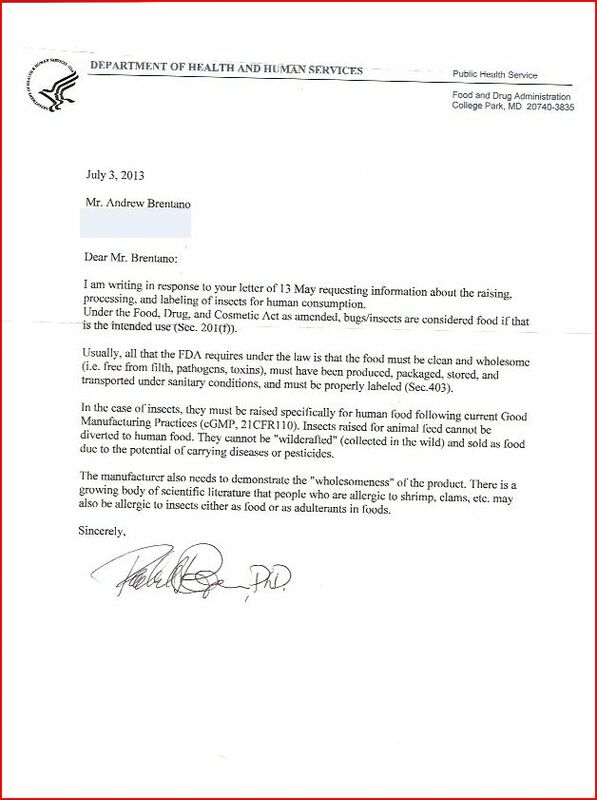 One of the speakers, who is from the FDA, mentioned that there was a standard response for edible insects. The key points he mentioned were on point with the letter Andrew received. The response I received was slightly different and didn’t have some of the same key points. Why don’t they match more consistently in content and language? Why must insects be raised specifically for human consumption? Corn is diverted all over the place. What is the basis for disallowing wild crafted insects? I feel its no different than trolling for shrimp. There is no mention of needing a GRAS determination. Whats the definition of ‘Exotic Food’ and why does it matter? This is the first mention of ‘Exotic Food’ I have seen. Its not in any regulations. Please share any letter or response you have received. This entry was posted in Regulations on October 10, 2015 by Bob.